Internet-based research, online collaboration, interactive learning methods, access to resources from any location - universities have to offer more than just a well stocked library to attract the best students. Students learn faster when they work with digital media. This was the result of a representative survey in 2011. A prerequisite for using digital media in the classroom is broadband Internet access, if possible by wireless. Hint: Click on the image for a bigger view. All secondary schools in Luxembourg were equipped with standardized, secure Wi‑Fi in the course of the eduWiFi campaign by the ministry of education. The newly built Mehr! theatre in Hamburg next to the central market has a delicate design and offers a highly modern network infrastructure for their guests, actors and employees alike. John the Baptist school was in need of a renewed network system, capable of meeting their demands for a stable and powerful wireless Internet connection as well as access to IT resources and classroom materials. Since the school year 2015/2016 the students of the Freiherr-vom-Stein-School in Neumünster enjoy mobile learning, BYOD and a digital learning platform thanks to a wireless network. With the help of Wi-Fi the regular and media school Meuselwitz in Germany brings interactive and multimedia content to the tablets of their pupils. The WHU - Otto Beisheim School of Management improves transparency for students, visitors and staff with radio-controlled signage of lecture halls, conference rooms and group-activity rooms. A stable and high-performance Wireless LAN at the Villa Wewersbusch, a private day school with boarding facilities in Germany, provides a fast access to online content and school servers for students and teachers. At the Heilig-Geist-Gymnasium Wuerselen, Germany, lessons for Year 9 classes are supported with tablets with mobile access to the Internet and school servers. The state-of-the-art WLAN infrastructure in use now at the University of Belgrade supports "eduroam" and gives quick and easy access to the worldwide web – a must-have for any institution in higher education. ARNES provides wireless access to the Internet for more than 50 primary and secondary schools. Needless to say, strict security requirements had to be met. The five sites of the Meridiaan College provide secondary education to about 3,500 pupils. The laptops of the students and teachers are integrated into the school network by means of wide-coverage Wireless LAN. Cheltenham Ladies College is one of the oldest and most famous girls schools in the United Kingdom. The school operates a controller-based network with more than 100 access points. 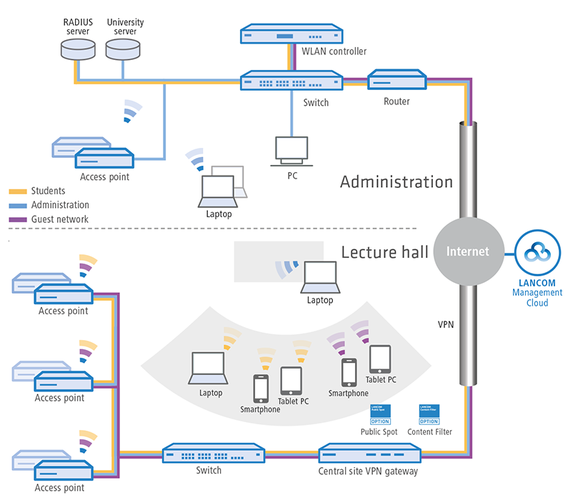 A standardized WLAN infrastructure optimizes the learning conditions for students at GISMA Business School in Hanover. Students, lecturers and staff can work mobile wherever they chose. The private tuition company benefits from paperless communication and efficient processes in administration. The backbone is the networking of the headquarters with around 650 schools. The HLW Haag operates a public WLAN network. The students of the vocational school can use their netbooks to access special programs or to research on the Internet. Universal WLAN coverage across the entire campus opens up new opportunities for teaching and research at the WHU. VPN technology from LANCOM networks 160 school sites with the local Education Board in the city of Bremen. The result: more independence, security, and cost savings.